:: Doppleganger :: Oh gosh! - Dreams are what you wake up from. see seee i knew it was u!!!!! I've watched it and I'm amazed as well. I ALSO SAY I ALSO SAY!! that harold so looks like you lor! huh, like my idol meh? 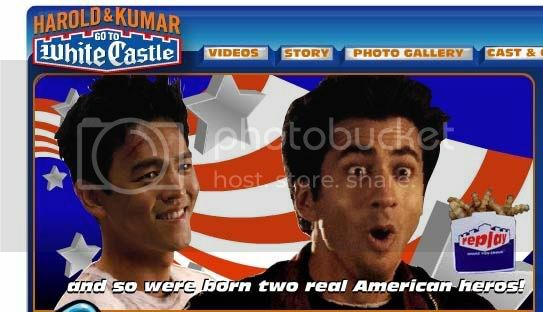 "and so were born two real American heros!" and mine should be doppelganger. Hahaha... john cho is DARN cute. :P And he's 32. Yeah!...hes the token chink who always wanted to get it on with the MILTF! ehh i was wondering about the similarity when i watched Better Luck Tomorrow. uhm, White Castle's equally good..albeit with a different slant. The jokes are not too lame, but some parts reminded me of Stephen Chow... absurd. The last part about the baggages was rather cute. Yar supposed ot be very funny! Wanna catch the movie together? i don't know what this is for until reading all these comments. what is the version number for andy lau, daniel wu then (though they look different)?